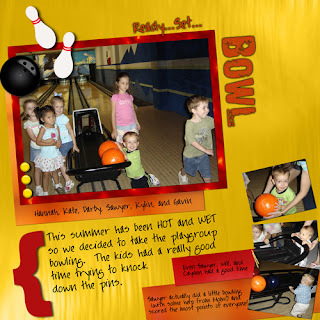 So we took the kids bowling on July 3rd because the weather has been unpredictable. Actually, it has been VERY predictable. It's been raining everyday since June 23rd. I'm ready for the rain to go away, although I'm not sure I'm ready for the HOT days of Summer to arrive. We've had a couple of really hot days, but that was back in May, I believe. It's been high 80s low 90s for the past month or so. But of course, it's also been raining, with record rainfall and lots of flash flooding. I now understand what people in Seattle feel like and why there is a high depression/suicide rate. Lately, it has been hard to get up and move around because it's so gloomy. But the sun is shining today! 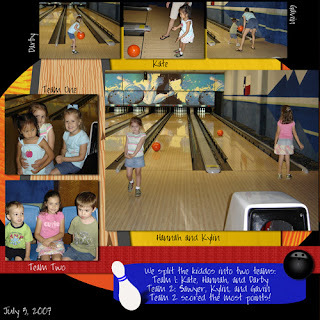 These pages were created with Megan Shanor's Primary Heat Mini Kit with Bowling embellishments by Bobbi Rosen. The Sketches are by Traci Reed and Kim Johnson.